Abstract: With nVIDIA rehashing their Ti4200\Ti4600's to incorporate 8x AGP technology, it was only inevitable that Albatron would redo their very successful Ti4200 Turbo's as well! For half of the price of nVIDIA's high-end GeForce4 Ti4600 videocard, you can grab yourself 90% if its performance with a GeForce4 Ti4200 based card. There's really no argument about which GPU has been the best value in 2002; the GeForce4 Ti4200 sits on that thrown, and rightly so. Now if you ask any computer enthusiast which GeForce4 Ti4200 to get, you'd no doubt hear the name "Albatron" mentioned more than once. 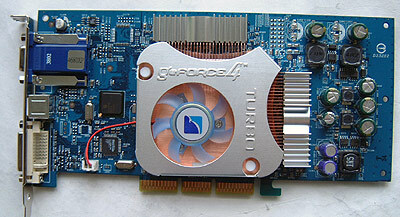 Albatron's original Ti4200P-Turbo videocard took the hardware community by storm. The card combined a Ti4400/4600 PCB and 3.3ns memory so well that many enthusiasts could overclock it well past Ti4600 levels. We played with the Ti4200P-Turbo in September '02 and were equally taken with its performance qualities. With nVIDIA rehashing their Ti4200\Ti4600's to incorporate 8x AGP technology, it was only inevitable that Albatron would redo their very successful Ti4200 Turbo's as well! Today we have an exclusive first look at the new Albatron Ti4680P-Turbo (Ti4200 GPU) with 8x AGP support. The Ti4680P-Turbo uses a GeForce4 Ti4200 core, and is based on an 8 layer Ti4600 PCB rather than the cheaper, "slower", and more common 6 layer PCB's most other Ti4200-8X cards use. Albatron have tweaked the PCB a bit - the board looks slightly different from the original Ti4200P Turbo - and continue to cool the 128MB of 3.3ns BGA DRAM with passive heatsinks. The new BGA heatsinks are little smaller then the first versions, but that is not really a big deal since memory sinks seem to be more for show then functionality. On the back, there are a couple of small ramsinks as well. Albatron employ the same large copper heatsink to cool the GPU on the Ti4680P-Turbo as they used with their original Ti4200P-Turbo, and from experience it seems to work relatively well. The card features a 15 pin VGA connector as well as a DVI and S-Video output (thanks to the Phillips 7104E chip). Along with the card came an S-Video to composite cable, S-Video to S-Video cable, composite to composite cable, some software (WinDVD, Motocross Mania, Serious Sam), a driver CD and of course the users manual. It would have been nice if Albatron included a DVI to Analog converter as well. Is 8x AGP just marketing hype? With the NV30 delayed until mid-February, and both ATI and SiS on the 8x AGP bandwagon, nVIDIA was not about to be left behind on store shelves. So a quick redesign and the GeForce4 was undertaken to bring 8X AGP support to the table. What 8X AGP does is double the bandwidth between the videocard and the system from 1.06 GB/s (4x AGP) to 2.1 GB/s. This means that potentially twice as much data can reach the videocard at any given instant. While this sounds great on paper, in real world situations it doesn't really boost performance as much as you might imagine with today's games. If you'd like a refresher on GeForce4 technology, please read our Gainward GeForce4 Ti4600 review. I'd expect anyone who will be buying the Albatron Ti4680P Turbo will most certainly be overclocking it - the copper GPU cooler, ramsinks, and name "turbo" just scream "overclock me!!" The question of the moment is thus, how well can you expec the Ti4680P-Turbo to overclock? Since the card is clocked at 250MHz core / 550MHz memory by default we immediately raised the core/memory to 300MHz and 650 MHz to start with. This is the default speed of the GeForce Ti4600 incidently, and the Albatron Ti4680P-Turbo didn't have any problems whatsoever (hence, the reason why this series is such a good value!). We then began to raise the core speed a little bit at a time, but ran into the wall at just 305 MHz.